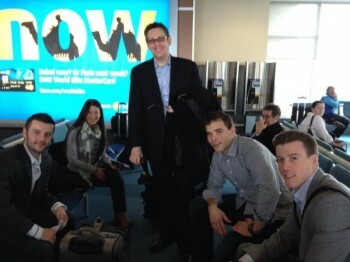 Two teams of MBA and MOT students travelled from Vancouver to Calgary to represent the Beedie School of Business at the Haskayne 24 Hour National Case Competition, hosted by the Haskayne School of Business at the University of Calgary. 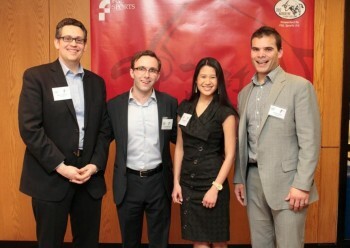 Teams of four competed in this three-day event, which challenged students from top Canadian MBA programs to compete in a pressure-filled environment. Sixteen competing teams were presented with information on an existing company and expected to solve real-life problems. Their business strategies were presented to a panel of senior business executives and critiqued on creativity, insight, substance and plausibility of implementation. “Don’t just go to compete, go there to win!” These enthusiastic words of advice came from Neil Abramson, our Emerging Markets Professor at SFU. I smiled in response, and wondered how we could really make it happen. Balancing our usual mountain of assignments, group projects and presentations with competition preparation was no mean feat. Practice began in the months leading up to the competition and the teams began to gel as we sacrificed our Saturdays for the cause. With the support of SFU staff members and students from past MBA cohorts, we began a training regime. We carried out case simulation after case simulation, and by incorporating feedback from judges we tightened our strategy as time went on. The flight to Calgary passed quickly and we were soon greeted by surprisingly warm weather upon arrival. After settling in, we made our way to the University of Calgary’s Haskayne School of Business to attend the opening reception, where we were treated to keynote speeches by Patrick Lor, CEO Fotolia, and Gary Kovacs, CEO Mozilla Corporation. Through personal photographs and witty anecdotes, these CEOs shared insights from their trials and experiences over the years. As the evening progressed we took advantage of the chance to network with our fellow competitors from across Canada, chatting over cheese plates and samosas. As the night wrapped-up we reconvened in our teams to confirm our game plan for following day. A full night’s sleep before the approaching storm was in order, so we all bade each other farewell for the evening. Bright and early, we made our way to the Haskayne School of Business, eager to receive our team envelope which would reveal the identity of the case company and contain the full competition case. Upon arrival we were escorted to our individual team rooms. Team names had been assigned to hide the identities and university origins of the teams. The name “Team Fook” was allotted to Brian Peterson, Tom Malcolm, Erica Hakonson and Chris Russell, while “Team Molson Coors” was assigned to Lucas Mitchell, Javier Glatt, Rob Graham and Rachelle Hay. When the envelope was ripped open we were met with a 43-page case, authored by Chuck Warnica, Oil & Gas Associate at CIBC Commercial Banking. The case focused on DIRTT Environmental Solutions, recently named one of Canada’s 50 Best Managed Companies and recipient of the Best Managed Award (sponsored by Deloitte, CIBC, National Post, and Queen’s School of Business). Based on DIRTT’s exceptional track record of explosive growth and exceptional financial performance, teams were to build a comprehensive and sustainable growth strategy for the company, carrying them forward for the next two, five and ten years, including a liquidity event in the medium term. Like horses on a racetrack we took off and ploughed through the case, examining financial records, performance indicators and competitor profiles. As the hours crept by, the walls of our private team room became covered from end to end in flip chart pages detailing our analysis and ideas. Over time, we hacked away at our computers, building the deck and creating graphs, models and pro formas to assess and support our recommendations. That afternoon each team was allowed 20 minutes with a Certified Accountant. We squeezed in as many questions as we possibly could, but before we knew it the 20 minutes had flown by and we were racing to incorporate the CGA’s feedback into our strategy. The work continued long into the wee hours of Saturday morning, but with the help of coffee, Doritos, and committed teammates, we encouraged each other to push through until we were satisfied with the caliber of our work. We had set our standards high and we were determined to give the competing schools a run for their money. After a few more grueling hours, we agreed to call it a night and headed back to our hotel rooms for a brief catnap before suiting up for the morning presentations. Later that morning, with the team wearing matching suits and loaded with even more caffeine, we made our way back to the competition where the teams pitched their strategies to the panel of judges. This was immediately followed by an antagonizing Q&A session where team members addressed a barrage of criticisms and queries from the executive panel members. By lunch time the four team finalists had been announced – with two of the four teams consisting of Team Fook and Team Molson Coors! Overcome with a mélange of excitement and exhaustion, we quickly ate lunch before being escorted to private preparation team rooms. The finalists were given one hour to tweak their presentations before presenting to a new panel of judges which consisted of leading Calgary businessmen, including Miles Nixon, DIRTT’s very own CFO and VP Finance. Each team was then drilled relentlessly in the Q&A session that followed. The competition results were not revealed until the formal awards dinner that evening, with Team Molson Coors and Team Fook from SFU’s Beedie School of Business placing second and fourth respectively. 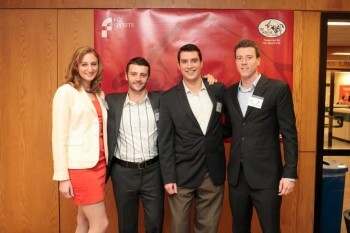 The DeGroote team from McMaster University placed third, with a team from the Haskayne School of Business the overall winners. All in all, it had been a gruelling but rewarding weekend, putting our MBA learning to the test. At this stage, it was only fitting that we make a toast to our achievements and to the Beedie School of Business. The celebratory sound of clinking glasses brought the evening to a close. We would like to extend our gratitude to the SFU staff, faculty and past cohort members that assisted us along the way and helped to make our success possible. We are especially grateful to Jeff Nehajowich for his unwavering support.